Walters hostel is situated in the heart of the Bernese Oberland, between the lake of Thun- and Brienz, and very close to the three most famous mountains in the whole of Europe: Eiger, Monch and Jungfrau..
Children younger than 12 years old pay half price if they stay in the same room. The bathroom and toilet facilities are located adjacent to your room. On request we will serve you a traditional Swiss breakfast. 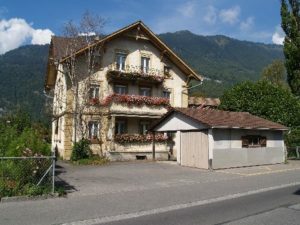 Walters hostel is only a seven minute walk from Interlaken Ost train station. Once you have gotten off the train at Interlaken Ost, take the street that leads you between the “wohncenter von allmen” and the Coop shopping centre. Continue straight ahead through 2 roundabouts (traffic circles).You will find us on the right hand side 20 meters after the second roundabout.